"I must admit that Horror of Dracula was one of the scariest movies I had ever seen, when it came out". 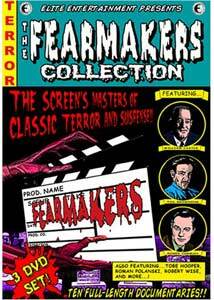 This ten episode set of The Fearmakers profiles "the screen's masters of classic terror and suspense", and is a companion piece of sorts to John McCarty's 1994 book of the same name, in which he profiled a large number of essential genre directors. For this three-disc set, the lineup of subjects has been whittled down to a respectable cross-section, featuring Jack Arnold, Tod Browning, William Castle, Roger Corman, Terence Fisher, Tobe Hooper, Roman Polanski, Jacques Tourneur, Roland West, and Robert Wise. Each episode bears a 1994 production copyright date, though a couple installments do reference more recent events, as with Samuel Z. Arkoff's death in 2001, for example. The Fearmakers series never aired in the U.S., though it is now getting a second wind with help from Elite, and that's good news for horror fans with a love of genre history. With McCarty serving as narrator (as well as one of three episode directors, along with Haley Richter and Wynn Winberg), each segment operates under the same general format over the course of approximately 25 minutes or so, offering up a little history, interviews and trailers/clips from the director being profiled. There's a nice representation and assortment of modern-day directors (including John Carpenter, Joe Dante, Stuart Gordon) and film historians/authors (including Bill Warren, Scott MacQueen, Michael Weldon) to discuss the long-lasting influences and impacts of key productions. The only time this format really varies is during the Robert Wise segment, in which the director's comments are sandwiched between mildly tacky title cards (such as "To Boldly Go") announcing the upcoming topic (in this case Star Trek). Most casual fans of the genre already know the works of directors like Tobe Hooper and Roger Corman, but the coverage here of equally important talents such as Jacques Tourneur (Cat People, I Walked With A Zombie) and Roland West (The Bat, The Monster) really expands on their own special level of influence so that this is not simply a rehashing of just household names and projects. Whether it be the Barnum-esque antics of William Castle or the daring creativity of Tod Browning, Fearmakers attempts to cover nearly every decade from the 1920s through the mid 1970s. Moments such as the "lost" scenes from West's 1930 shadowy noir/horror/thriller The Bat Whispers represent some of the most exhilarating visuals of any of the works highlighted in any of the ten episodes in this set. West's use of light and shadow is beautifully eerie and stark, and still looks dramatically stunning today. There are some episodes that seem to have trouble filling the time allotted with genre-specific "fearmaker" material�the Polanski ep spends a fair amount of time discussing Chinatown�while the segments on Terence Fisher could have been twice as long and still not covered the subject�especially the Hammer years�adequately enough for me. But what makes this set even more enjoyable than the insightful comments of directors and historians citing why a given film is so important are the abundance of trailers and clips used throughout. This footage�though some of it is in terrible condition�is the kind of thing that is the ultimate hook here, and it really reinforces the level of influence these films have had. This isn't a perfectly polished exercise, as the narrative content is occasionally a bit jumpy, and a few of the eps appear to end rather abruptly. Yet these sloppy editing moments can be overlooked for the wealth of pure geek love of the often slighted horror genre, and where it's possible to listen to others who also consider a film like Terence Fisher's Horror Of Dracula to be the one of the all-time greats. It might be preaching to the choir a little, but it's reassuring to know I'm not alone. Image Transfer Review: Each episode is presented in 1.33:1 fullframe, though some of the trailers within each ep are show in nonanamorphic widescreen. The talking head interviews are a hodgepodge of quality, ranging from strong colors to moderately washed out, but across the set these inconsistencies are at least consistent. What I mean is that a particular interviewee will always look bright (Bill Warren) or dark (Anthony Timpone) no matter which episode they appear on. Some of the 1950s/1960s trailers used are really not in the greatest shape in the world, though ironically footage from Roland West's 1930 The Bat Whispers looks like new. A few of the interviews suffer from horrible color flicker, as well. It's a mixed bag here, bordering on the mediocre. Audio Transfer Review: Audio is presented in a serviceable but somewhat flat 2.0 stereo track. The voices of the interview subjects are clear, though quality levels vary by individual (Joe Dante's segments in particular sound quite tinny). No major hiss or crackle issues�except on some of the older trailers�and the only time I wished there subtitles was during some of the quieter comments from Robert Wise. Extras Review: Packaging for this three-disc set is a fairly bulky, hinged NexPak case, with each disc getting its own panel. The effect of the packaging and its thickness�combined with the retro pulp comic cover art (complete with X-Ray Spex and sea monkey ads)�gives it the appearance of a book. Other than the nice case presentation, there are no extras at all on any of the discs. The video presentation is a little snarky, and some of the segments leave a lot of unanswered questions, but if you're a fan of horror this can still be a whole lot of fun. It's a movie-geek-friendly sampler platter of the works of some of the genre great, with comments and insight from film historians, directors, writers, producers, actors interspersed with relevant clips from the films and/or those wonderfully lurid trailers. Highly recommended for fans of vintage horror.